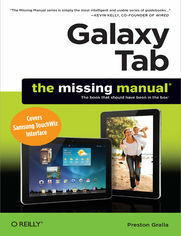 Galaxy Tab lets you work, play, read, and connect on the go, but mastering its TouchWiz interface and finding the best apps can be tricky—unless you have this Missing Manual. Gadget whiz Preston Gralla provides crystal-clear explanations and step-by-step instructions to get you up to speed quickly, whether you have the 3G/4G or Wi-Fi version of this amazing device. Design your experience. Add interactive widgets and mini-apps to your screen with TouchWiz. Satisfy your appetite. Download thousands of games and apps from the Android Market. Keep in touch. Chat, videochat, check email, and browse the Web. Find your way. View maps, use the GPS, and navigate turn-by-turn. Manage your media. Shoot and view photos and videos; organize and play your music. Stay informed. Read books, newspapers, and magazines. Be productive. Use Google Docs to store and share documents. How Do I Get Social? What Do Those Album Icons in the Gallery Mean?